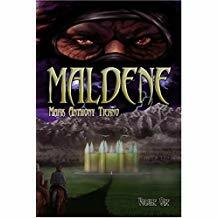 In a world of magic and ancient secrets, “Maldene” is just the start of a great fantasy and sci-fi adventure that readers will surely enjoy. A world beyond time… an adventure beyond imagining. Mark Anthony Tierno truly shows his storytelling prowess as he brings his masterfully crafted fantasy novel to the table. Readers will experience a world filled with magic and science through the book’s page-turning plot. Get to know a world of mystery, encounter a great king and a gold-skinned seer, powerful wizards and immense dragons, and much more around every corner as this book takes you on an exhilarating ride. “Maldene” opens up the beginning of this wonderful story. Sabu, a young wizard, along with his elven friend, Eldar, are on a quest to seek a destiny foretold to them by a blind gold-skinned gypsy. Together with their companions, they fight mighty dragons, visit other worlds, discover secrets from the past, and look for answers to defeating the most villainous evil of them all, Miro. Go on an adventure that is sure to exceed your wildest imagination with “Maldene.” Indeed, it’s a novel that comes with great surprises on every corner. It will surely be an unforgettable ride on every turn of the page. Challenge your imagination with the adventure that unfolds in “Maldene.” See if Sabu, Eldar, and his friends can discover the secret behind Miro’s power before his long-gestating plans come to fruition. The first book of “Maldene” available in a two-volume set. “Maldene: Volume One” is available on: https://www.amazon.com/dp/B00BA4K2UI and “Maldene: Volume Two” through: https://www.amazon.com/dp/B00XZZXW66. Great deals are also available through the book’s official site: www.maldene.com. Order “Maldene: Volume One” and “Maldene: Volume Two” now! Mark lives in his hometown of Monrovia, CA. He is the recipient of degrees in Physics and Math, and a lifelong reader of fantasy and SciFi. Having spent most of his adult life caring for one parent, then the other, the only thing that maintained his sanity was discovering his talent and love for writing; a talent his parents well appreciated. “Maldene” is the first book in a series that will redefine the word Epic.